Functional mature cells of the hematopoietic sys­tem in adults are derived from proliferation and differentiation of their progenitor cells, the com­mitted stem cells (Fig. 1). By definition, the com­mitted stem cells derived from multipotent stem cells through differentiation and proliferation processes can give rise to only one type of dif­ferentiated cell. The stern cells should respond to a physiologic control for a normal function. This control is apparently mediated through some specific regulatory functions, i.e., transitions of precursor cells to differentiated cells require reg­ulatory factors. Some regulatory factors have a long-range effect on cellular differentiation, whereas others are closely associated with a specific environment and exert a short-range ef­fect (33). 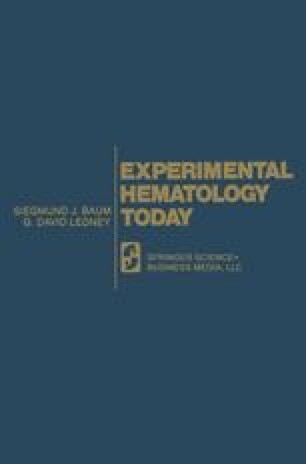 Because the normal function of the hematopoietic system is dependent on a continu­ous supply of mature cells, appropriate cell-factor interactions are critical for the maintenance of the normal function of blood cells. Derangement of this interaction will naturally impair the normal function of hemopoietic tissue. Leukemia may result from this de­rangement (12, 21, 34, 49).